This 7/8 CT. T.W. 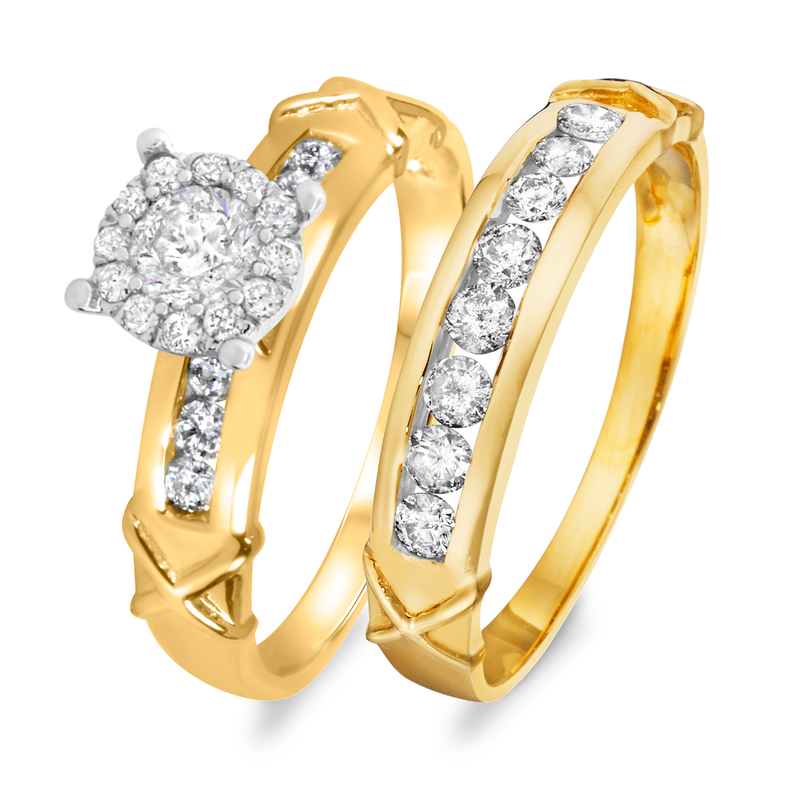 Diamond Women’s Bridal Wedding Ring Set is made in 14K Yellow Gold and has 27 Round cut natural, conflict free diamonds.Certificates of Authenticity included with purchase, provides proof of value and certifies diamonds and gold to be Authentic and Conflict Free.Gold:Yellow 14KRing Width (MM):0Number of Diamonds:27Total Diamond Weight (cts):7/8Diamond Quality:I1-I2Diamond Color:H-IDiamond Cut:Round-brilliant-shapeSetting Type:Channel, Invisible, Side-stoneStyle Number:BR110Y14K-C0118. This matching 1/3 CT. T.W. Diamond Men’s Wedding Band is made in 14K White Gold and has 30 Round cut natural, conflict free diamonds.Authentic Diamond and Gold Mens Wedding Band/Ring with conflict free diamondsGold:White 14KRing Width (MM):8Number of Diamonds:30Total Diamond Weight (cts):1/3Diamond Quality:I1-I2Diamond Color:G-HDiamond Cut:Round-brilliant-shapeSetting Type:Prongs, Side-stoneStyle Number:BT502W14KM8. This 1 1/2 CT. T.W. 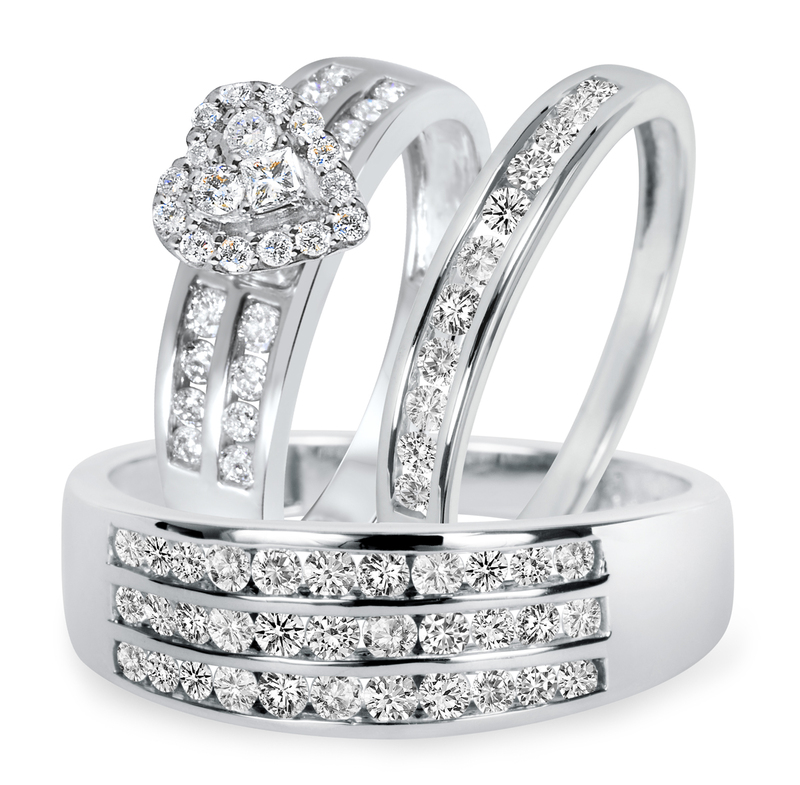 Diamond Women’s Bridal Wedding Ring Set is made in 14K White Gold and has 45 Round cut natural, conflict free diamonds.Certificates of Authenticity included with purchase, provides proof of value and certifies diamonds and gold to be Authentic and Conflict Free.Gold:White 14KRing Width (MM):0Number of Diamonds:45Total Diamond Weight (cts):1 1/2Diamond Quality:I1-I2Diamond Color:H-IDiamond Cut:Round-brilliant-shapeSetting Type:Solitaire, Channel, Invisible, Side-stoneStyle Number:BR111W14K-R1008. This 3/4 CT. T.W. 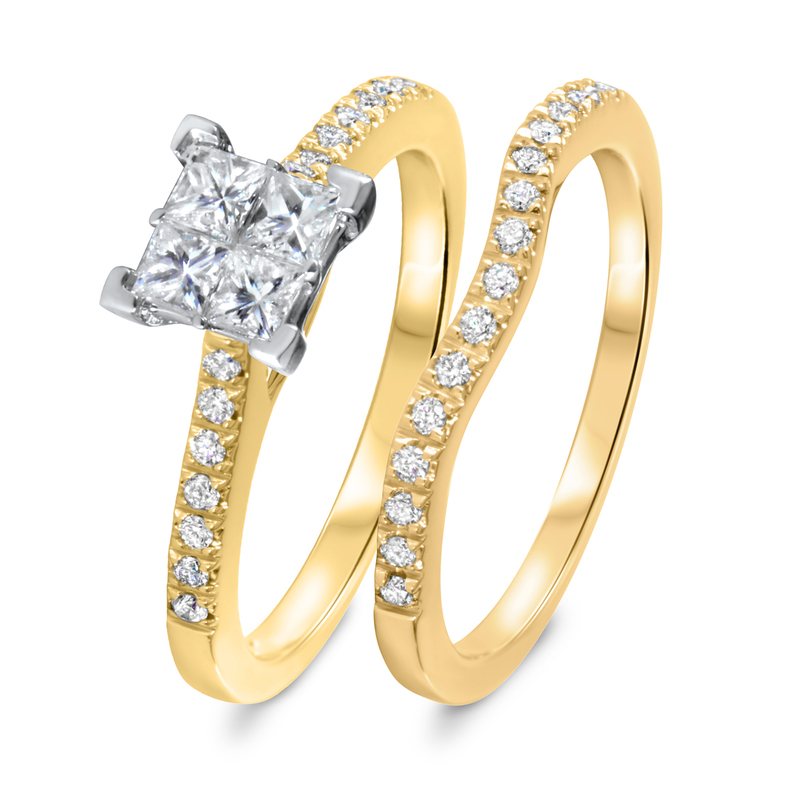 Diamond Women’s Bridal Wedding Ring Set is made in 10K Yellow Gold and has 33 Princess, Round cut natural, conflict free diamonds.Certificates of Authenticity included with purchase, provides proof of value and certifies diamonds and gold to be Authentic and Conflict Free.Gold:Yellow 10KRing Width (MM):0Number of Diamonds:33Total Diamond Weight (cts):3/4Diamond Quality:I1-I2Diamond Color:G-HDiamond Cut:Princess-shapeSetting Type:Prongs, Side-stoneStyle Number:BR706Y10K-C0028. This matching 1/6 Carat T.W. 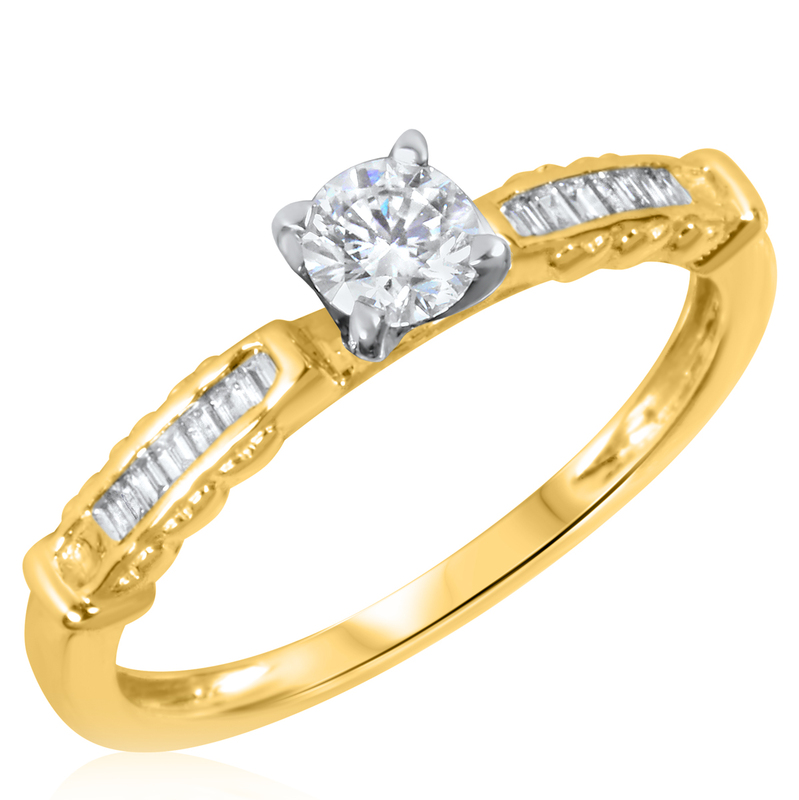 Diamond Women’s Wedding Ring is made in 10K Yellow Gold and has 7 Round cut natural, conflict free diamonds.Authentic Diamond and Gold Ladies Wedding Band/Ring with conflict free diamondsGold:Yellow 10KRing Width (MM):5.56Number of Diamonds:7Total Diamond Weight (cts):1/6Diamond Quality:I1-I2Diamond Color:H-IDiamond Cut:Round-brilliant-shapeSetting Type:Prongs, Side-stoneStyle Number:BT137Y10KL8. This 1/3 CT. T.W. 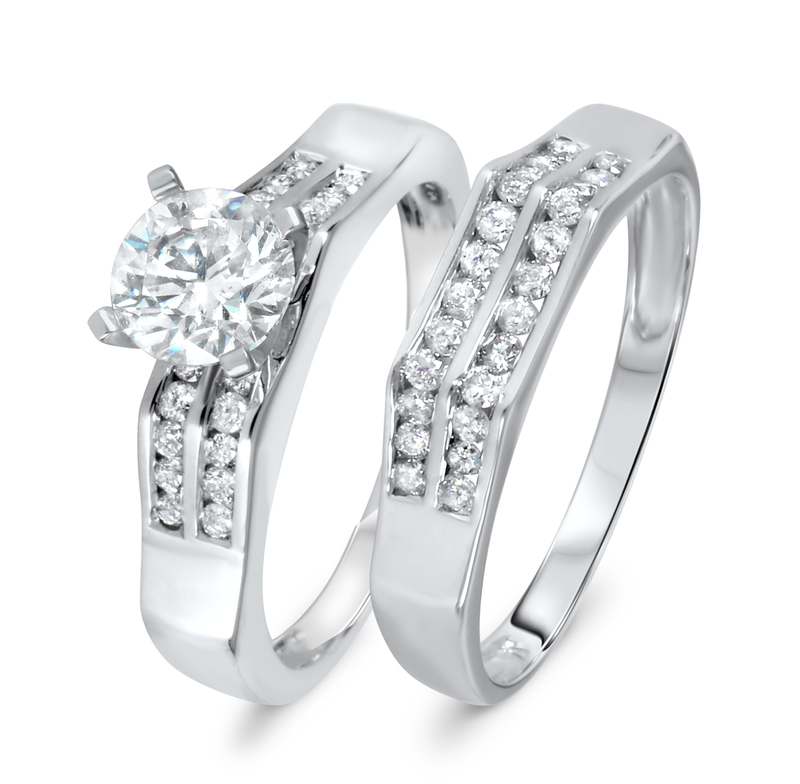 Diamond Ladies Engagement Ring, Wedding Band, Men’s Wedding Band Matching Set is made in 10K White Gold and has 9 Princess, Round cut natural, conflict free diamonds.This Trio Set includes three matching diamond rings: the Ladies Engagement Ring, Ladies Wedding Band & Men’s Wedding BandGold:White 10KRing Width (MM):0Number of Diamonds:9Total Diamond Weight (cts):1/3Diamond Quality:I1-I2Diamond Color:G-HDiamond Cut:Princess-shapeSetting Type:Prongs, Side-stoneStyle Number:BT709W10K-C0038. This 1 1/2 CT. T.W. 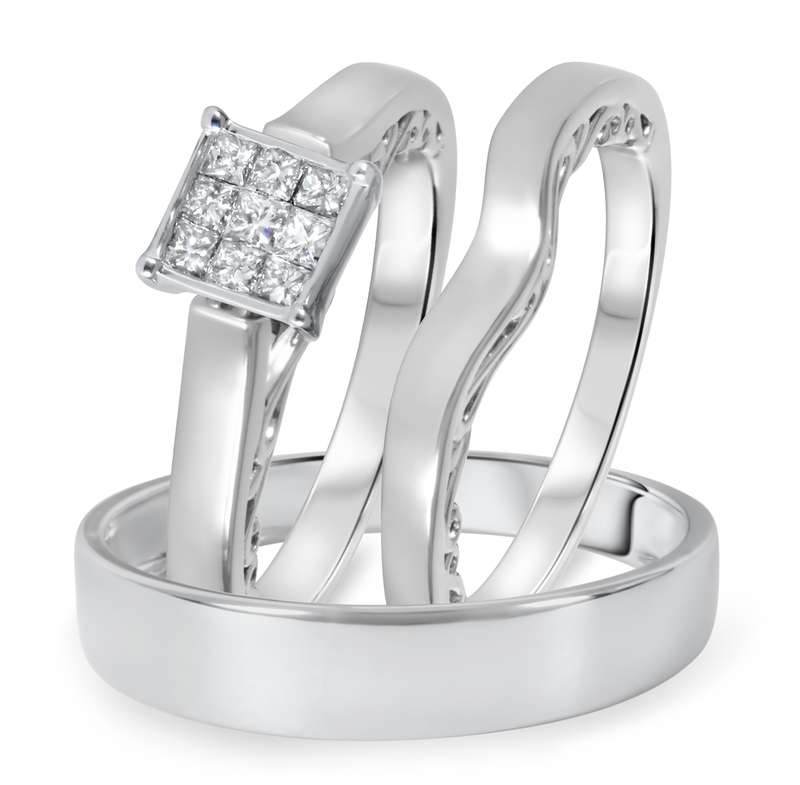 Diamond Ladies Engagement Ring, Wedding Band, Men’s Wedding Band Matching Set is made in 14K White Gold and has 77 Princess, Round cut natural, conflict free diamonds.This Trio Set includes three matching diamond rings: the Ladies Engagement Ring, Ladies Wedding Band & Men’s Wedding BandGold:White 14KRing Width (MM):0Number of Diamonds:77Total Diamond Weight (cts):1 1/2Diamond Quality:I1-I2Diamond Color:G-HDiamond Cut:Princess-shapeSetting Type:Prongs, Side-stoneStyle Number:BT500W14K-C0108. 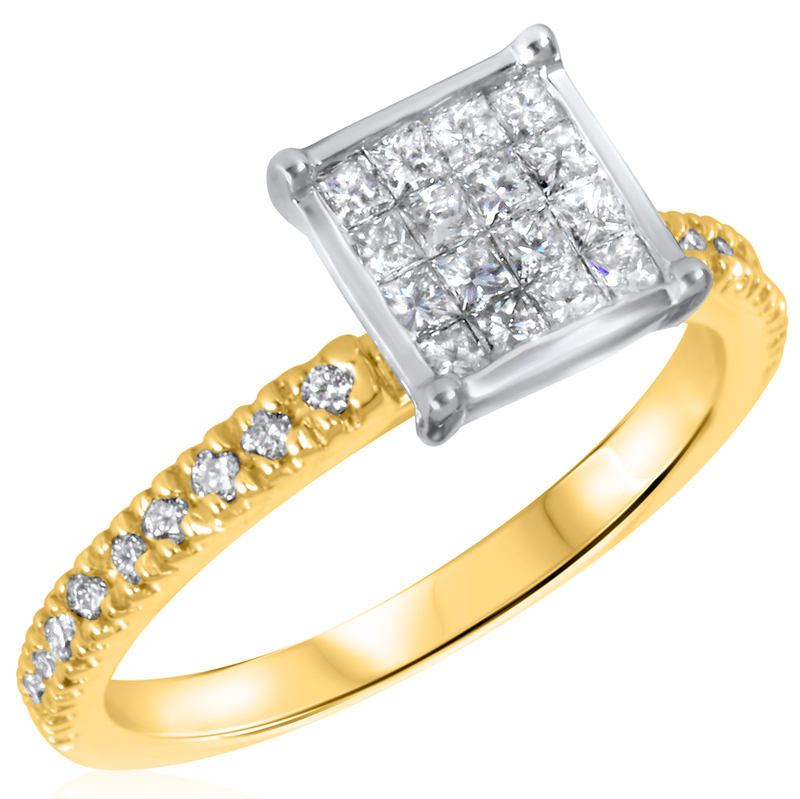 This 1 1/2 CT. T.W. 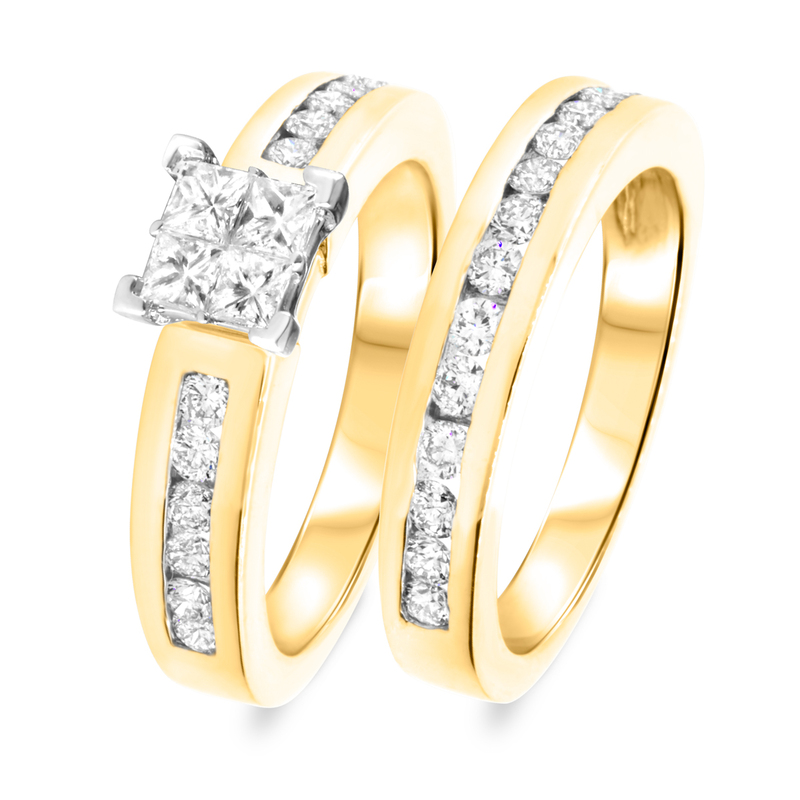 Diamond Women’s Bridal Wedding Ring Set is made in 10K Yellow Gold and has 31 Princess, Round cut natural, conflict free diamonds.Certificates of Authenticity included with purchase, provides proof of value and certifies diamonds and gold to be Authentic and Conflict Free.Gold:Yellow 10KRing Width (MM):0Number of Diamonds:31Total Diamond Weight (cts):1 1/2Diamond Quality:I1-I2Diamond Color:H-IDiamond Cut:Princess-shapeSetting Type:Side-stone, ChannelStyle Number:BR321Y10K-C0028.